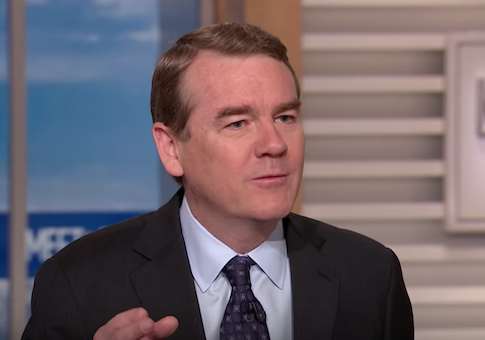 Colorado senator Michael Bennet, estimated as having a net worth of $16 million, said on Sunday income inequality is the most pressing concern in the country, ranking above health care, voting rights, campaign finance reform, or the "green new deal" currently being proposed by the party's far left flank in the House of Representatives. "Think about what we've done since 2001," the Democrat said on NBC's "Meet the Press" on Sunday. "We've cut taxes by $5 trillion, almost all of that went to the wealthiest Americans. We've spent $5.6 trillion—the president says $7 trillion—on wars in the Middle East. So that's $11 trillion, $12, $13 trillion that we did not spend to address the most important issue facing this country which is our lack of economic mobility and the huge income inequality that we have." Bennet's net worth is an estimate based on required financial disclosures in which the official only has to list the value of an asset within a dollar range, so exact figures are not available. However, using the midpoint value for all the asset holdings, the Center for Responsive Politics assessed the $16 million figure. Not long after Bennet first took office after being appointed by then-Governor Bill Ritter, a similar report estimated the senator's net worth as being between $6 million and $27 million. "A spokeswoman for Bennet said his net worth is closer to the bottom than to the top of the range he reported," a Denver Post said in 2009. A request for comment from the senator's office on his current net worth was not returned to the Washington Free Beacon. Part of Bennet's wealth comes from managing funds for the Anschutz Investment Company for Colorado billionaire Phil Anschutz, one of the wealthiest men in the world according to Forbes, and well known for his conservative political leanings. Although he's kept a low profile for much of his time in the senate, Bennet recently exploded on the senate floor in a tirade directed at Republican senator Ted Cruz of Texas while debating what eventually would become the longest government shutdown. The outburst went viral and Bennet later used the moment to run some paid social media advertisements in the key early presidential voting states of New Hampshire, Iowa, Nevada, and South Carolina. Joe Scarborough recently touted Bennet as a possible dark horse candidate in the 2020 race. However, some of the editorial's reporting could foreshadow questions about a privileged upbringing, the very kind that some have argued only help perpetuates the upper classes being able to maintain that status generation to generation. "On paper, Bennet's biography is far too conventional for today's left-leaning Democratic Party," Scarborough wrote. "He's a graduate of Washington, D.C.'s tony symbol of prep school education (St. Albans), as well as of Wesleyan University and Yale Law School. His grandfather worked for FDR, his father was a Washington fixture for decades, and his brother, James, runs the New York Times editorial page." Another national story that still looms should Bennet decide to run is a financing decision he made while serving as the superintendent of Denver schools that soured and cost the district millions, garnering attention from the New York Times. "The Denver schools essentially made the same choice some homeowners make: opting for a variable-rate mortgage that offered lower monthly payments, with the risk that they could rise, instead of a conventional, fixed-rate mortgage that offered larger, but unchanging, monthly payments," the Times report noted. "Since it struck the deal, the school system has paid $115 million in interest and other fees, at least $25 million more than it originally anticipated." This entry was posted in Politics and tagged 2020 Election, Colorado, Democrats, Income Inequality. Bookmark the permalink.